Boadicea the Victorious is one of those perfume houses that I've managed to ignore for a while. It happens to be an easy line to ignore, because it has such limited availability; moreover, something about Boadicea has always irritated me. Maybe it's the cumbersomely large range of scents (does anyone really need to start a new line with forty-plus fragrances? ), the strenuous emphasis on "luxury" and "heritage," or the single-adjective fragrance names that are hard to distinguish from one another as well as difficult to read on Boadicea's small, black-on-black labels. When I finally stopped by Henri Bendel to try a few Boadicea the Victorious fragrances, I was joined by a sales associate who turned out to be well versed in the line. After I had picked up a few bottles, spritzed a few paper blotters, and decided that neither Romantic, nor Inspiring, nor Delicate (which seems like a knock-off of Penhaligon's Bluebell) were making any strong impression on me, the sales associate suggested that I try Exotic. Fragrances with the word "exotic" in their descriptive text rarely appeal to me, and I would not describe myself as "exotic" by any means, but I took the newly sprayed blotter from her and inhaled. Then I tested Exotic on my wrist, and I ended up savoring it for the rest of the afternoon; and when I later got my hands on a sample vial of Exotic, I enjoyed it all over again. Exotic is not, surprisingly, a tropical white floral or a papaya-and-passionfruit cocktail. The Boadicea website describes Exotic as a composition of African costus, lavender, bergamot, lily, rose, frankincense, musk, and ambergris. Luckyscent has a different set of notes that seems to be based on an earlier press release from Boadicea: musk, black truffle, ylang-ylang, bergamot, blackcurrant, patchouli, vetiver, vanilla tears, and sandalwood. My own impression of this fragrance agrees with certain notes from both lists. I'd classify it as an oriental gourmand: the most distinctive, central accord is a dense, almost earthy (truffle-like?) cocoa note with ginger and patchouli stirred into it. There's an almost astringent bergamot top note that leads nicely into that ginger-chocolate effect; however, I didn't notice any isolated floral notes or any blackcurrant in the heart. The fragrance's base is a spicy-woody vanilla with further hints of patchouli, vetiver, and just a touch of sweetness; it's definitely not a powdered-sugar vanilla like the dry down of L'Artisan Parfumeur Traversée du Bosphore, for example. Exotic has average staying power, although I would have expected a little more tenacity from something at this price point. It could easily be worn by men as well as women. In a recent review of Boadicea's Explorer, Kevin wrote that many people might find that fragrance "too simple…more a perfume base than a fully developed fragrance." I might say the same of Exotic: it's rich and dark, but slightly rough. If Exotic were a textile, it would be a piece of velvet with raw, unfinished edges. If it were a garment, it would be one of the boxy faux-fur vests that are apparently all the rage this winter. I recently wore Exotic on a rainy, blustery day when I had to get a lot of work done and I needed something warm and a bit sweet, but more formidable than a comfort scent, and Exotic fit the bill perfectly. And I do remember liking another Boadicea fragrance, Divine, when it was recommended by that helpful sales associate, so perhaps a second visit to the Boadicea counter is in my future. 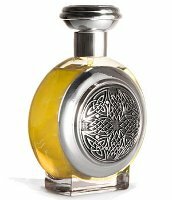 Boadicea the Victorious Exotic is available in 50 ($175) and 100 ml (£130) Eau de Parfum. For buying information see the listing for Boadicea the Victorious under Perfume Houses. 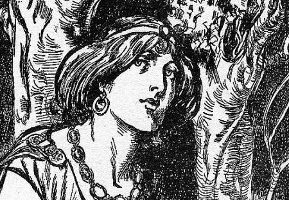 Note: image is Queen Boadicea (artist unknown) [cropped] via Wikimedia Commons. This is a line I’ve avoided as well and for roughly the same reasons. There’s too much to choose from & the bottles don’t help the matter. There’s something about the line that makes me feel as though they’d be better suited for some metaphysical bookstore and sold at a fraction of the price. The scent sounds nice. I enjoy a comfort scent with a bit of a punch, but the price tag is so off putting to me. “Metaphysical bookstore” – that’s wonderful, K.
M, Dawn Spencer Hurwitz should keep you busy for a while! Actually, I’m not crazy about the Boadicea bottles — I probably would have gravitated towards this line sooner if the bottles were, I don’t know, more varied or more refined — but I may be in the minority. Klytaemnestra, The price *is* high… I suppose this line could be called “aspirational.” Still, pricing these fragrances higher than Frederic Malle, L’Artisan Parfumeur, etc. seems a bit silly. They seem excessively so. I’m not opposed to shelling out a few hundred dollars for something that I absolutely adore, but while these seem nice they just don’t seem that exciting. Especially not $175 for 50 ml exciting. I may snag a sample of this just to give it a sniff, though. I figure it’s something that I’ll like but probably could live without so no fear of falling hopelessly in love and springing for a FB. My next luckyscent order includes Boadicea The Victorious. How do you rhink this compares Jessica? Dolly, which BtV scent or scents did you select? I haven’t tried them all, by any means! Thanks for the review, Jessica. Alas, I have to agree that this line has too many fragrances for too much money. I’m with Klytaemnestra and will pay for something, even if in the hundreds, if I really feel I can’t live without it–I’m looking at you, SDV, Tihota and Chinatown Crystallized, which was my first *really* pricy buy–but this sounds too similar to lots of other gourmands out there for far less, like a Parfumerie Generale or L’Artisan. Also, with such a profusion of fragrances in the line, the odds are rarely in my favor that I’d like one that sells well enough to stick around. lol at “Chinatown Crystallized”… those fancy Bond bottles can be pretty tempting. I wonder how the Boadicea line is selling, at Bendel and Harrod’s, or wherever else it is available. I have no idea. Maybe it has very loyal fans who buy multiple scents from the line. Quite true! Thouhg we perfumistas might be considered “Frag geeks” and prone to spend obscene amounts of a few precious drops of fragrant liquid, I really do not believe there are that many of us ready to dish out that kind of money for just about anything labeled niche and rare. Bonds are barely worth it. Barely because the design, packaging and marketing drive their prices alwasy up, but at least they are far far from “perfume base”, niche trash kind of frags. Full blooded perfume fragrances make us salivate and reach for the plastic in our vallet, but that’s it! Boadicea, you are victorious only name wise, not market wise. Dory, I disagree with you. I love Boadicea the Vicorious and have 7 parfumes from this House and I always get many compliments when I wear them (I own Exotic, Intense, Salubrious, Languid, Precious, Delirious, Passionate and Invigorating). But maybe Dutch people don’t know the meaning of Victorious? People have different taste, people want different things in live. Some people love Serge Lutens, I don’t. But that doens’t make his parfumes bad. Thats your opinion. But not a common one! It’a personal and I love this house, but it’s my taste, not a common one..